My mother in law is one of the sweetest women that you can imagine. At four feet eleven she is a powerhouse of joy. About seven years ago, she had a minor stroke, that caused her a day or so of being ‘lost’. She took off in her car up the interstate looking for a place to turn around until she ran out of gas. A good-samaritan found her and put her in a motel room. We got her situated in an elderly care facility some weeks later. She was doing well enough that she did not need to be in assisted living. The docs wanted to put her on an Alzheimer’s med, but my wife and her sister decided against it. She did well until a year ago when she had a urinary tract infection and a bad reaction to the antibiotics used to treat it. It is my belief that she was not getting good nutrition and this was part of her problem. After this episode she was moved into assisted living. Late last summer we were advised that she needed to be moved to the Alzheimer’s unit because her memory was failing. That decision was delayed and we decided to start giving her sulfur supplements as MSM and a supplement that supports the phospholipids in the brain – phosphatidyl choline. And of course we were giving her vitamin D3 and multiple vitamins. At ninety-three years old, she seems to be stabilizing very well. In any case, we have been able to keep her out of the Alzheimer’s unit. 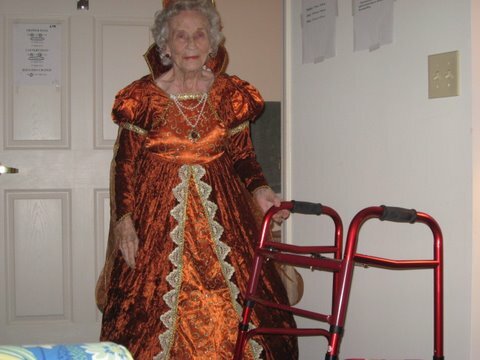 In fact she was doing so well this past fall, she borrowed her great-granddaughter’s Halloween costume, dressed as the Queen of England, and won best dressed at the party they had. 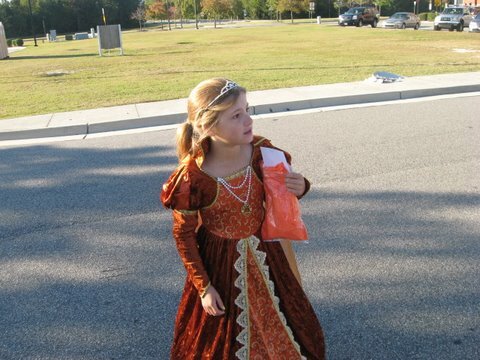 And of course her great-granddaughter won the next day in the same costume at her Halloween party. We arrived at using the sulfur through Stephnie Seneff’s paper, Could Sulfur Deficiency be a Contributing Factor in Obesity, Heart Disease, Alzheimer’s, and Chronic Fatigue. In her paper she refered to a work by Ronald Roth, Alzheirmer’s: Nutritional Causes, Treatments and Prevention. It is amazing to look at the chart and see how far below normal that sulfur is. Sulfur is also a natural antagonist (removes if from the body) of copper and alumminum, two culprits identified as being elevated in Alzheimer’s. I have since found a paper that says that vitamin D regulates one of the biological pathways or the sodium-sulfur cotransporter. More on that later. This entry was posted in Alzheimer's, sulfur, Survivor Story by Mark Pegram. Bookmark the permalink. Mark, your mother-in-law seems like a wonderful woman. I wish her continued stability. She is also quite fortunate to be surrounded by loved ones who are aware of food and Vitamin D supplementation in cognitive function.